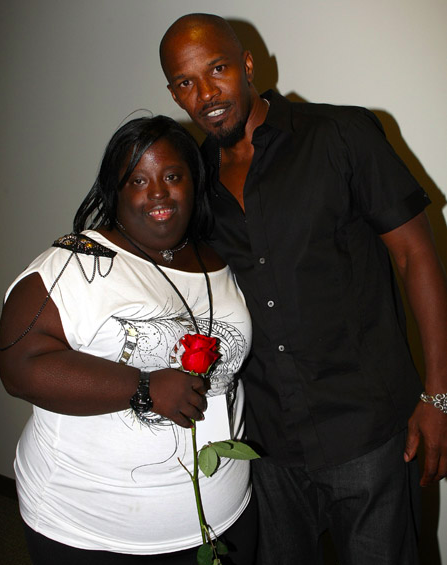 Jamie Foxx (49) has always had a very close bond with his 33 year old sister, DeOndra Dixon. His sister has Down Syndrome and Jaime has oftentimes spoken out about her in interviews. Many of us are also familiar with DeOndra because she’s always by her big brother’s side on red carpets, award shows, and other events, smiling for the cameras. As her provider and protector, Foxx always has his sister’s back and treats her like a princess. That’s why when she makes big wishes like the one Jaime revealed about Chris Brown, he tries his best to make sure DeOndra’s wish is his command. Brown’s visits makes DeOndra beyond happy and as y’all can see, Jaime is humbled that Brown takes those moments outta his busy schedule to put a smile on his sister’s face. Foxx: I’m shooting a video called “Blame It On The Alcohol,” my sister [DeOndra] says, “Big bruh you gon’ let me get down, right?” I said ‘What you mean?’… “I wanna dance in the video,” [DeOndra said]. I said ‘Okay cool.’ So everybody’s there, Quincy [Jones]…Samuel Jackson….. And we’re shooting, so it’s getting late and she’s like “Big bruh don’t forget about me, ’cause I wanna do my thing.” And I looked down and what was interesting was she had a lil’ purse…and there was some hair sticking out the purse. I said ‘What’s that?’ She said “Oh that’s my ponytail, I’mma put that in …when it’s time to get down,” LOL. I said ‘Girl go put your ponytail in! LOL. Jones was so impressed after watching DeOndra during the video shoot, that he connected her with Global Down Syndrome foundation. DeOndra became the ambassador for the company and has gone to congress to speak about Down Syndrome. Also, she and her big brother have now raised millions of dollars for Down syndrome research through the foundation. Go ‘head DeOndra!